It looks like you're on linux? 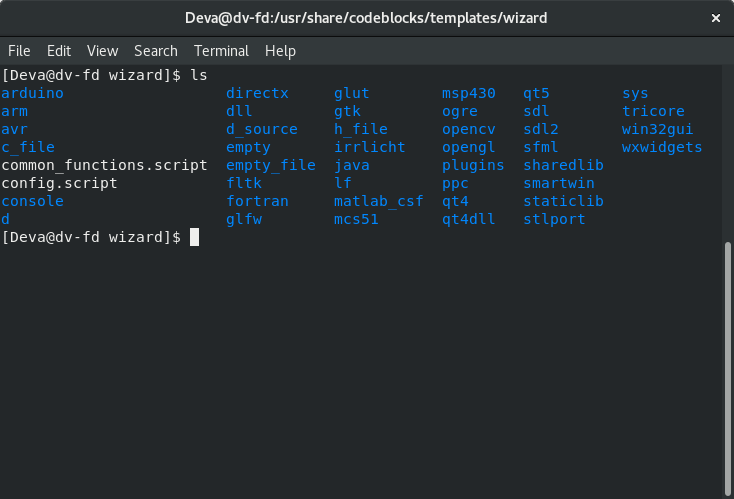 Do you have any files in /usr/share/codeblocks/templates/wizard/ ? What version of C::B do you use? Where did you get it? Can you post a "ls" from this folder? Make sure the Scripted Wizard Plugin is enabled. I got codeblocks 17.12 .. I download it by the comand sudo dnf install codeblocks. p.s. Please do not use non normal fonts and colour, it is a bit annoying. Then something is totally broken. This is the problem. For some reason you don't have any plugins installed. You should check if you need to install any related packages. Search for ones starting with codeblocks. This is the problem. For some reason you don't have any plugins installed. But wouldn't then the wizard not start at all? And the compiler plugin is always installed, also without contrib-plugins isntalled. I think this is a problem with the wxListCtrl and i had it also at some point in history. I do not remember what i have done to fix this. 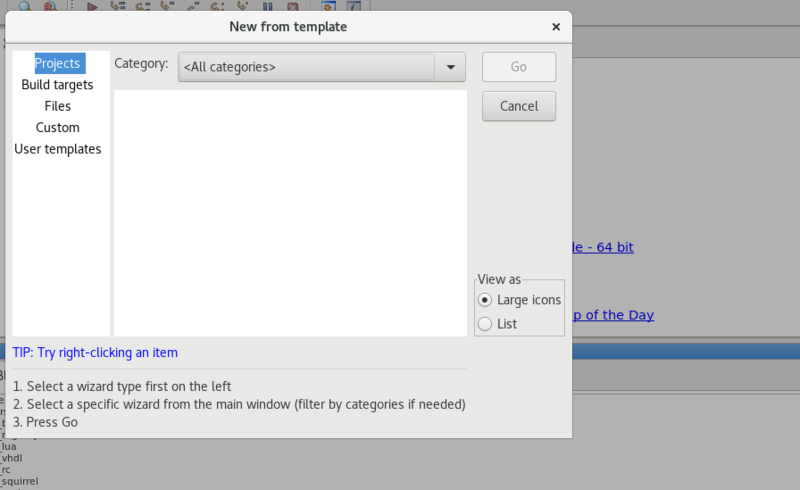 If installing the contrib package did not help, can you show us the Settings->About dialog? Try to disable the scripted wizard and you'll see the same empty dialog. I've just tried. I installed the packages but still got the same problem. How do i disable the scripted wizard ? What version of fedora are you using? And can you list all the packages you've installed and where have you downloaded them? sry, it is in the "Help->About" sub menu. can you repost the log after installing and restarting codeblocks? Can you restart codeblocks with the "-d" option and post the content of the "codeblocks-debug" tab? 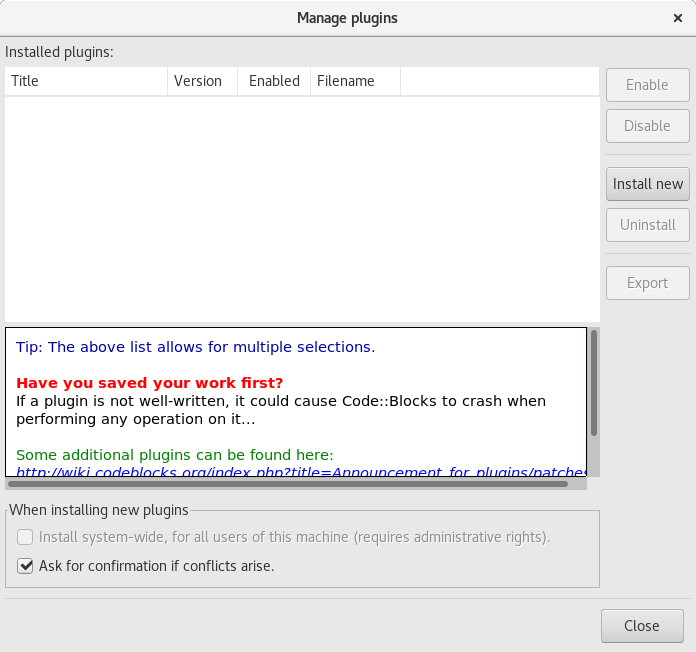 Is the plugin dialog still empty after installing the plugins package? I got fedora 28 , I install packages from codeblocks site. Have you tried to use the packages provided by your distribution? I can see that fedora 28 has packages for 17.12. The command is something like "dnf install codeblocks", but you should remove all packages related to codeblocks before you run it, to be safe. What do you mean you've tried? What commands have you tried? "Isn't working" won't allow us to help you, because it doesn't give us any information. yes I download the packages using the command sudo dnf install codeblocks. and still got the same problem . Hm... Are you saying that 17.12 doesn't work on fedora 28? I don' see anything? Have you posted a image? Anyway, i am interested in the wxWidgets version you are using. This is written in the about dialog.